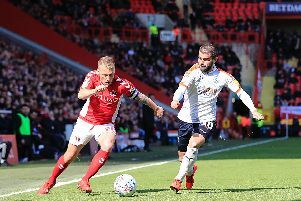 Striker James Collins believes the signing of Barnsley midfielder George Moncur will give Luton’s squad a huge boost as they look to secure a second successive promotion this term. The 25-year-old joined permanently for an undisclosed fee last week, and was well known to the Hatters’ players and fans alike after a starring role during the Tykes 3-2 win over Town at Oakwell back in October. He came close to marking his debut for Luton with a goal in the 4-0 win over Peterborough on Saturday, seeing his shot cleared off the line, but Collins was clearly impressed by the club’s newest acquisition. He said: “He was the best player on the pitch by a mile when we played Barnsley, he was instrumental in everything they did. “So for him to come in to our squad at this vital time, it can only boost us. “He’s a great lad and we can see what qualities he’s got. Moncur put pen to paper with the club still looking to appoint a permanent manager, Mick Harford currently taking interim charge. That showed just how strong a position Town are currently in according to Collins, who added: “The board and the backroom staff, they’ve obviously done their homework and felt they needed to get him in.